Commanding the stage with a bona fide star’s aplomb, Frederica von Stade endows Ricky Ian Gordon and Leonard Foglia’s graceful opera, “A Coffin in Egypt,” with wit, drama, and grandeur as she portrays the many moods, bitter to elegiac, of a woman, age 90, who has survived all the people she cares about and reminisces about the life she spent in a backwater Texas town even as she longed more for the livelier, more stimulating milieu of Europe and New York. Gordon and Foglia take their text from Horton Foote’s play of the same name about Myrtle Bledsoe, a woman of dignity and high aspirations who marries a wealthy Texas landowner and is tied to him and his property except for the few instances when he, tired of Myrtle’s justified complaining, finances trips abroad, and she experiences a wider world that is more to her liking but is unavailable but for her husband’s limited largesse. Foglia’s script neatly follows the thought patterns of an elderly woman who repeats, needs reminders, and expresses pleasures and regrets in turn. As a director, Foglia focuses on his leading lady, knowing all facets of Myrtle will be revealed with equal wistfulness in von Stade’s capable hands. The actress can fly into rages at her husband’s infidelity and relative stinginess, then coo sweetly as her reverie takes her from Egypt, Texas to the monuments of ancient Egypt that she visited on one of her excursions. A consummate artist, von Stade can effectively and affectingly express the humiliation Myrtle endures because of her husband’s unhidden affairs and the exhilaration she feels when fabled theatrical producer Charles Froman tells her she is suited for the stage or when some swain is continentally gallant to her as she tours European capitals. As adept at acting as at singing, von Stade presents the full complexity of Myrtle. Even in her character’s happiest moments, von Stade sustains a shade of pathos that shows the memory that is giving her joy reminds her of the monotony and sadness of her life in general. The combination of temperament and humor, seasoned by a that constant tinge of regret, leads to a complete portrait of Myrtle and the events that add up to the life she is mentally reliving in Gordon and Foglia’s chamber opera. Von Stade, with the help of an excellent supporting cast, makes Opera Philadelphia’s production of “A Coffin in Egypt” one to remember and savor among one’s fondest thoughts. Gordon’s music is a marvelous surprise as the composer uses idioms from the periods that spans Myrtle’s life and deftly blends lilting folk melodies, themselves a combination of Copland and traditional American music, with melodic passages that evoke Myrtle’s moods, which rooted in reverie, can change like quicksilver. Gordon’s vocal line is more exemplary of late 20th century music, remaining at a conversational pitch that sometimes elevates into arias or soars into sequences of great drama and passion. Von Stade and her castmates, Carolyn Johnson, David Matranga, and Ben Sheaffer, so beautifully express the sentiments in Foglia’s libretto, the opera sails along seamlessly, always involving and always entertaining. Johnson is particularly wonderful as Myrtle’s sister-in-law, Elsie, a woman whose life is beset with calamities and who looks to Myrtle for support while being sympathetic to all Myrtle is forced to tolerate from her husband, Hunter. She is also entertaining as a clerk who makes a mark because of Johnson’s shrewd portrayal. Matranga can be cantankerously stubborn, casually indifferent, and mildly repentant as Hunter. His work adds to the enjoyment of the opera. Ben Sheaffer handsomely plays the man Myrtle passes over in favor of Hunter. Kate Bianco is perfect as Myrtle’s aide and companion who does not utter a word but expresses empathy, humor, understanding, and a sense of duty in her eyes and posture. In addition to the tuneful passages that captures Myrtle’s emotions, Gordon’s score includes sounds that evoke nature, birds and winds in particular, and the dusty Texas climate. To evoke the Southern Gothic atmosphere of Egypt, Texas, he punctuates scenes, using passages of Myrtle’s life or recollections like motifs, with Gospel music that indicates the spiritual tone of Egypt and reflects the scattered jubilation and frequent losses Myrtle experiences. “A Coffin in Egypt’s” Gospel quartet, always welcome, has Veronica Chapman-Smith, Julie-Ann Green, Taiwan Norris, and Frank Mitchell to thank for much glorious singing. Egypt, Texas is not the mostly lively place. Houston and San Antonio are the nearest towns, and it is a trek to get to either of them. Small and religious,, Egypt is the type of place where everyone knows everyone and his or her business. Hunter Bledsoe is one of the more notorious citizens of Egypt. He is a philanderer and has a special relationship with a mulatto woman who runs a brothel. His wealth keeps him from being shunned or ostracized. Even when he kills a man who objects to Hunter seeing his underage daughter without a thought of divorcing Myrtle to marry her, Hunter’s money spares him prosecution or imprisonment. Myrtle is not native to Egypt. She is from a Texas town that is not unlike it, but once she marries Hunter, her ties with her relatives and her community are severed. Her life, far different from what she envisioned for it, will be spent in Egypt as the comfortable but often and openly disgraced wife of Homer Bledsoe. The two daughters she bears will not be much comfort to Myrtle, and both will predecease her. Most of Myrtle’s experience would have been cause for misery, Her life with Hunter would have been enough to turn most people to eccentricity or distraction. Myrtle, though, has a core of strength. As portrayed my von Stade, she is erect and proud at 90. Her dignity and sense of inner pride have kept Myrtle alert and as productive as possible while she is figuratively entombed in the home Hunter built for her in Egypt. Routine activities like gardening and painting occupy much of Myrtle’s time. She also enjoyed walking through the verdant areas around Egypt and taking in views and nature. These rare instances of appeasement give Myrtle the chance to see the world she would have liked to enjoy in the style she’d have liked to enjoy it. She takes her daughters to Europe. “A Coffin in Egypt” is set from the turn of the last century to the 1970s, so Myrtle is a young woman doing what Victorians would consider a world tour. The year is 1908. Wars have not yet begun to brew in Germany and France. America is prosperous under Theodore Roosevelt. Myrtle tastes freedom as she never has before, and loves it. Throughout her reverie, she talks about men who were gentlemanly and gallant to her. She mentions Charles Froman’s offer a half-dozen times. She talks about the culture she witnessed, the culture she soaked in, and the culture that was missing in Texas. Von Stade sings about sailing on the Nile and seeing Cairo in the other Egypt. A sarcophagus she sees there becomes the symbol of her life, Foote’s play, and Gordon and Foglia’s opera. Foglia is careful to show the plentitude in Myrtle’s life while giving her good reason to vent about the deficiencies of her marriage and the available activities in Egypt, Texas. As an elderly person would, Myrtle repeats herself, so we hear which memories are the most engrained and have the most influence, positive and negative. Von Stade is a formidable Myrtle. You see a pillar of the community, a doyenne who has held her head proud when other women may have bowed it. Myrtle felt her humiliation, but she faced down those who would bring it up to or throw it at her, even if they were her relations. You see an woman who has contented herself in the gentle activities that helped fulfill her days — reading, painting, and being around nature. Whatever hand Myrtle was dealt, von Stade shows she is a woman who is able to cope with it and maintain her strength, her character throughout. Myrtle has faults, her pride and temper being two of them. Perhaps her greatest is being dependent on Hunter’s wealth and preferring to live a comfortably small life in Egypt than risk making her own way in the world and enduring possible difficulties including financial shortages. Von Stade, in her artistry, conveys Myrtle’s ultimate unhappiness while also showing the peace she has made with her past, her sadness, her losses, and her decisions. She is a woman who has bitter memories and would probably count her life as being less than she hoped in terms of luster, but she is one who, in remembering her lot, comes to accept it and will probably go on in her gentle, routine way until her end arrives. Gordon and Foglia, with a nod to Horton Foote, have crafted a lovely work of art. Frederica von Stade makes it all the more wonderful to behold. The 100 minutes or so “A Coffin in Egypt” needs to unfold flew by, and one would have welcomed more. 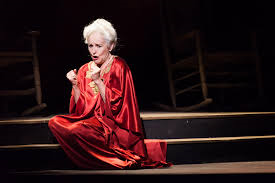 Myrtle mentions she has chosen red as the color that best represents her, and Riccardo Hernández dresses von Stade in a flowing, loose-fitting red caftan that suits the dignity and the style of the character. His simple set, a yard in which Myrtle paints, relaxes, and tells her story to her silent companion, is spare, but it supplies all that is required. “A Coffin in Egypt,” produced by Opera Philadelphia, runs through Sunday, June 15 at the Perelman Theater of the Kimmel Center, Broad and Spruce Streets, in Philadelphia. Remaining performances are 7:30 p.m. Wednesday, 8 p.m. Friday, and 2:30 p.m. Sunday. 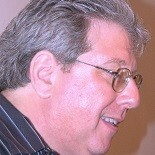 Tickets range from $136 to $21 and can be obtained by calling 215-893-1018 or by going online to www.operaphila.org. This entry was posted on June 11, 2014 by nzoren in Theater Reviews and tagged A Coffin in Egypt, Carolyn Johnson, drama, Frederica von Stade, Gospel, Horton Foote, Kate Bianco, Leonard Foglia, Opera, Opera Philadelphia, Perelman Theater, Ricky Ian Gordon, Southern Gothic.